For many months now, society JUUL Labs faces many aggressive criticisms and regulatory threats. 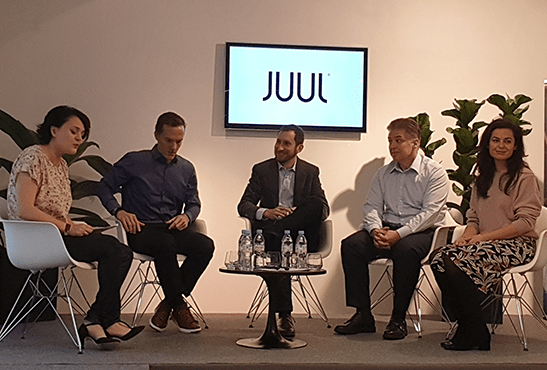 In the context of imminent federal regulations in the United States, the e-cigarette manufacturer Juul "Recently released a video of the original thesis defended at Stanford that allowed the launch of the product become unavoidable. By doing so, the founders of Juul want to show their good faith and prove that the goal has always been in the interest of risk reduction. JUUL, A DEVICE TO KEEP THE "BENEFIT" AND TO DISAPPEAR "NOCITY"
This is not an extraordinary revelation as the founders of the Juul e-cigarette have already told their story. The two men met and became friends after cigarette breaks at Stanford University. They finally decided to design an alternative product to cigarettes. A few days ago, Juul Labs published an original and really original document, a video of the thesis defended at Stanford, presented by James Monsees (MFA in product design) and Adam Bowen (MSME in product design). And the founders of Juul Labs absolutely want to defend their project and specify that they have always wished to be part of a principle of harm reduction while aiming to preserve the "benefit" by eliminating in passing the "harmfulness" that we found in cigarettes. « It's not nicotine that hurts you, it's the burning of tobacco. Said James Monsees. In the presentation of 2004, Adam Bowen presents a slide showing the demographic forecasts of the future company. The two founders felt that in certain social categories, social smokers would be very numerous. Ten years later when the thesis project evolved to become ploom, then the e-cigarette Juul As we know it today, Juul Labs has made a marketing decision that it probably regrets today. Indeed, the first marketing campaign for the e-cigarette has brought to light young people using Juul. To date, many people who criticize Juul Labs often refers to this campaign as the departure of the famous "craze" of young people for the product that the FDA describes as "epidemic". In order to reverse this trend Juul Labs has taken measures including an investment of 30 million dollars for prevention among young people. The company also proceeded with the removal of "fruity" flavored cartridges, the removal of its social media, a more stringent age verification application for online sales, and a legal push against counterfeiting. More recently, Juul Labs has decided to launch a new 10 million dollar ad campaign aimed at attracting adult smokers. Previous: FRANCE: New price increase for cigarettes this Friday!